The Open/Close Shift feature in CellSmart POS allows you to open and close shifts and record each shift details in the software in order to keep track. You can open and close shifts as your employees change their shifts throughout the day. Click on the Close shift option from the Home screen. Then enter the cash you leave in the register for the next day in the leaving cash field. Then, count the register cash and enter the amount in the manual count field. Enter the account or credit card amount you received in the account field. The software will tell you the variance amount in red. This amount is the difference between the amount that was calculated in the software and the amount that you entered. At the bottom left corner, the software will tell you the amount and whether you are short, over or breaking even (Good to go). At the bottom right corner the software will tell you the total money you counted. Once you're done, click on the Close register button and the shift receipt will be printed. Note: The total sale amount of the shift will be shown in the total sale box. The shift open and close date/ time will be listed on top of the window. The money count tab allows you to enter any register details such as cash count, credit card amount. 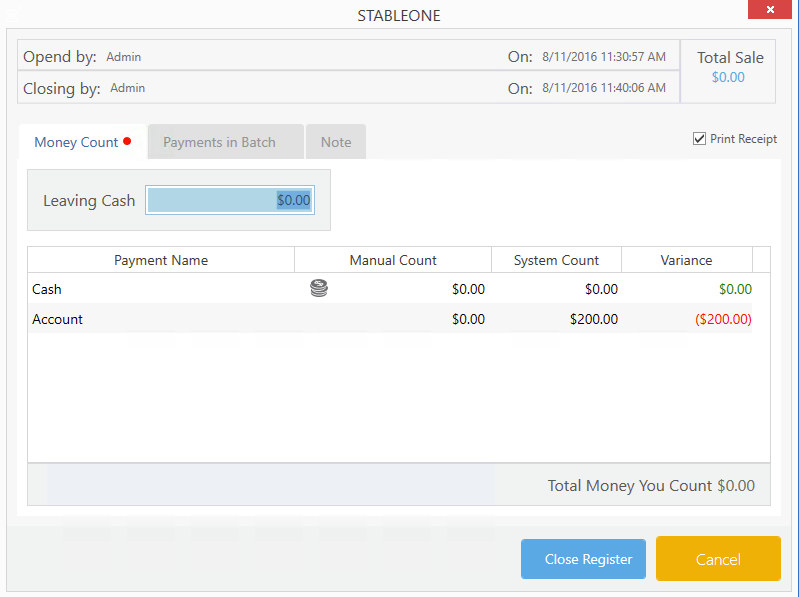 The payments you have in your batch will be listed under the payments in batch tab. You have the option of entering any necessary notes regarding the shift in the note tab.